This information takes a woman-centred approach to pregnancy options. It’s based on the belief that women are the experts in their own lives so they are the ones who should make the decisions about their pregnancy. Women are in the best position – morally, legally and practically – to make a decision based on their strengths, limitations and resources. Activity - ​What's influencing your decision? Details of activity and worksheets available in PDF of this information. "focuses on helping you, the woman, by looking first at you and your needs, thoughts, feelings and beliefs in relation to the options available to you with an unplanned pregnancy. The reason that you need to focus on yourself first of all is that you are the most important person in the process of decision-making for an unplanned pregnancy. This is not to say that others are not important but that it is vital that you don’t forget yourself and your own needs in making this decision"
Give yourself time – quality time – cut down on commitments. Get a clear picture of your present situation. Get information about the options available. 3. What information do you need? Write a list of all the questions you want answered. Do not punish yourself – be your own best friend and advocate. Listen to your heart (fantasy) and head (practicality). Let them have a kind conversation with each other. Your physical and emotional wellbeing is a priority. 7. Do I want to talk about this with anyone? What support will I need from them? Am I likely to get it? 8. Who is around to give me support? Who will give me support with my decision? Who is around to provide practical support? We women know when it is or is not the right time to bring a child into the world. We use our heads and our hearts to see clearly the pros and cons of our three choices: parenting, placing for adoption, or having an abortion. We know better than anyone else what we can and cannot handle emotionally, physically, financially, and mentally. We know our own limits and strengths. We know when the choice of abortion can prevent the harsh consequences of bringing a child into the world when we are not ready or able to do our child justice. We act out of compassion when we wait to have a child until the time when we can give it the kind of life every child deserves. We act out of love when we consider what we would be taking away from the child or children we already have if we brought another child into our family now. We take care of our physical health by considering our medical history and the risks that come with pregnancy, labour and delivery. We take care of our mental health by making decisions that limit the strain we place upon ourselves and those we love. We think clearly when we call our abortion decision one of ‘self-care’ rather than calling ourselves selfish. We must care for ourselves before we can take care of another human being. We see clearly beyond other’s words, ‘I’ll help you out if you have the baby…’ We know that the responsibility for raising a child will fall squarely on our own shoulders. We have foresight enough to know that ‘having a baby’ doesn’t stop with infancy. It means raising a child who will need our financial support, time and attention for as long as it takes the child to become an independent adult. Women throughout all time and throughout the world have made the decision to have an abortion, whether or not abortion was safe and legal. Women have risked their own lives to avoid bearing a child they could not adequately care for. Childbirth, miscarriage, and abortion are all parts of women’s lives. Women of childbearing age from every generation, occupation, income level, race and religion have had abortions. Whatever their choice, women know the truth about their lives. This information takes a woman-centred approach to pregnancy options. It’s based on the belief that women are the experts in their own lives so they are the ones who should make the decisions about their pregnancy. 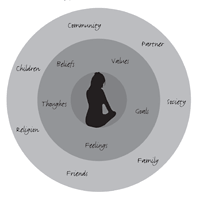 Children by Choice, ‘Guide for decision-making: A Woman-centred approach to pregnancy options’, Queensland, <http://www.childrenbychoice.org.au >,Viewed January 2010. ‘Guide for making a decision’ adapted from Liz Norris’ ‘Unplanned Pregnancy: Making your Decision’ worksheet, Canterbury Consulting, Camberwell, Vic, 1994. Baker, A & Stewart Berg, J, ‘We Women Know’, Abortion and Options Counselling, 1995, The Hope Clinic for Women, Illinois, USA.